Full information, regarding Route Details and Times is in our event brochure, available to all participants on morning of registration. Head and Tail support vehicles. Sweep vehicle for those who are unable to complete the route. Option of Massage/physiotherapy service for tired muscles. Free admission to heritage presentations. Evening meal & breakfast at Treacy’s restaurant, 4 course celebration meal at Ashbrook House, Durrow, Snacks & light Refreshments along the route. information pack prior to event. Meals: For those of you who have registered as 2day cyclists i.e. €125 paid; Evening meal on Friday 24th and breakfast on Saturday 25thwill be provided at Treacy’s Restaurant, The Heath, Co. Laois, in addition to an evening celebratory meal at Ashbrook House, Durrow on Saturday 25th, on completion of cycle rally. Those registered as Day 1 only cyclists i.e. €60 paid, can avail of breakfast at the Attanagh Museum and evening meal at Treacy’s. Those registered as Day 2 only cyclists i.e. €70 paid, will be provided with breakfast at Treacy’s and evening celebratory meal at Ashbrook House. Light refreshments and water will be provided for all cyclists at selected stops on both days of the event. Meals will be along traditional lines, however, should you have any special dietary requirements, please let us know in advance (by Thursday August 23rd)and we will do our best to facilitate you. Souvenir Passports:These will be issued to all cyclists. However, special stamping of passports can only be assigned at selected sites, where a cyclist has completed that leg of the journey. Passports are yours to keep as a memento of the occasion. Accommodation:Camping facilities are available at the Heath, Co Laois (courtesy of The Heath GAA Club). Toilet and shower facilities are available here. Cyclists should bring their own tents and camping requirements. These will be transported in our accompanying vehicle. Hotel upgrade is available at the nearby, Gandon Inn Hotel. At present only one family room (one double and one single bed) and one double room (double bed) is available. Additional cost @ €105 for family room; (suitable for three people sharing) and €40 per person sharing, for double room. Contact: Gandon Inn 057 86 26622. Rooms are blocked booked, so mention the Bulfin Cycle and Password: Matt Doyle. In addition, there are a couple of single occuppancy rooms (one female, one male) available for sharing. If in doubt you can contact Hugh on 086 86 94691. What should I bring? Transport will be provided for the duration of the event for your personal luggage, however, we would encourage you, not to bring the “kitchen sink”. So by way of suggestion; A towel, your personal toiletry requirements, change of clothes, cycling helmet, perhaps a small torch, also some “Deep Heat” would be handy should you have aching muscles! And of course … the sun screen!!!! Perhaps a bit of rain gear … just in case! Please ensure that your luggage is fitted with a personal identification tag. It is a requirement of the insurance providers that cycling helmets must be worn when on the road during this event. A few examples of the vintage feel to some of our previous Bulfin Heritage Cycle Rally events. It is the responsibility of individual cyclists to ensure the safety and roadworthiness of their bicycle prior to involvement in this event. 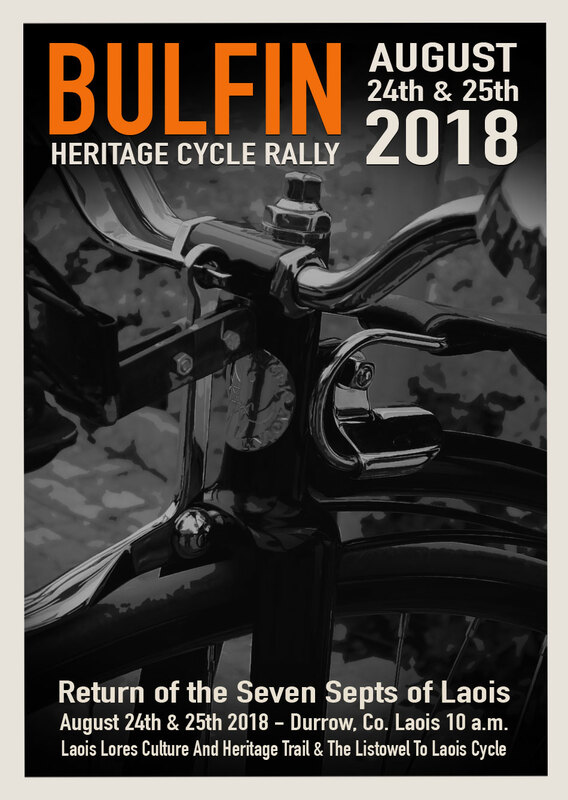 In an effort to uphold the ethos and authenticity of the event, “High Nelly”/Vintage bicycles or their genuine replicas is the preferred mode of transport. Cyclists are encouraged to wear suitable period costume, where possible. Lycra, of course, would not be appropriate for this event. Simple but suitable period costume worn by cyclists would be a welcome addition to this novel event. We will be filming the event for a DVD production, therefore, it would be great addition to the event aesthetics, if we could put our “best foot forward”in this regard. Please be aware that photography and video footage of the entire event will take place. In the interests of Data Protection, a Participants right to “step back” from these functions, will be fully respected. Thank you for your interest in this unique event and we look forward to meeting you all on Friday 24th & Saturday 25thfor what promises to be, a fun filled and historic cycle. For anyone wishing to avail of an extended stay in the Durrow area, the following is a list of B&B accommodation available. Durrow House, The Square, Durrow, Co. Laois. The Castle Arms Hotel, The Square, Durrow, Co. Laois. Ashbrook Arms, The Square, Durrow, Co. Laois. Acorn Lodge, Dereen, Durrow, Co. Laois. Pius Hennessy, Mary St, Durrow, Co. Laois. Castleview, The Square, Durrow, Co. Laois. Elizabeth Brennan, Tinweir, Durrow, Co. Laois.